dmsr is one of more than 5,000 organizations on LibraryThing. About meThe Des Moines Scottish Rite is one of the largest Masonic organizations in Iowa. The members of the Knights of Saint Andrew, an organization within the Des Moines Scottish Rite, maintains the library. 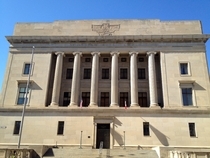 About my libraryThis collection is housed in the Des Moines Scottish Rite Masonic Center.